Second Ferment: La Girolle: Une grande folie de goût! La Girolle: Une grande folie de goût! Two years is a long time between visits. Yet somehow when my BFF and I get together, it's as though time kindly waited for us to take a break in our crazy-busy lives. And then we pick up right where we left off. Part of this most recent mini-vacation to Québec was spent at La Girolle, a small-ish, crowded French bistro on Chemin Ste-Foy (pronounced FWAH, if you please.) The noise is deafening, the proximity to other patrons' elbows a little too close for comfort ... but the food more than makes up for it. Our waitress rolled the chalkboard menu over to our table and then rhymed off each of the items in fuller detail. Clearly she'd been studying this for days, as her delivery was flawless and she had answers for even the most obscure questions. 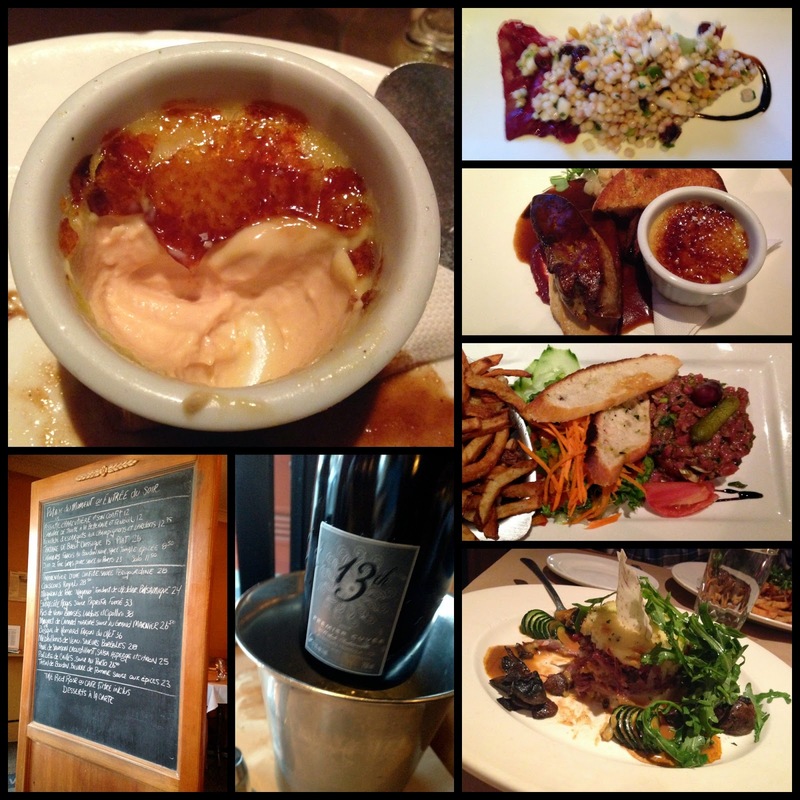 I was sold on the Foie Gras Two Ways: pan-seared and crème brûlée. Yeah, you read that right. CRÈME BRÛLÉE FOIE GRAS. Also? An enormous puck of beef tartare coupled with crispy Belgian-style frites. French bistro dining at its finest. Since bubbles go with everything, I brought a 13th Street 2008 Premiere Cuvée, rich with brioche and slightly sweet toasted notes, a fine mousse and a tangy, brisk finish. My bestie and I toasted friendship, the kind that never fades, and enjoyed our feast to the fullest.